Congratulations to the New England Patriots for a hard-fought victory at Superbowl 2017 (they came back from a 25-point deficit in the third quarter, the largest comeback in Superbowl history)! With this win, Tom Brady has become the first quarterback to have five Superbowl rings. Meanwhile, I spotted a Samsung Gear 360 and a Panono among the crowd of reporters and photographers. 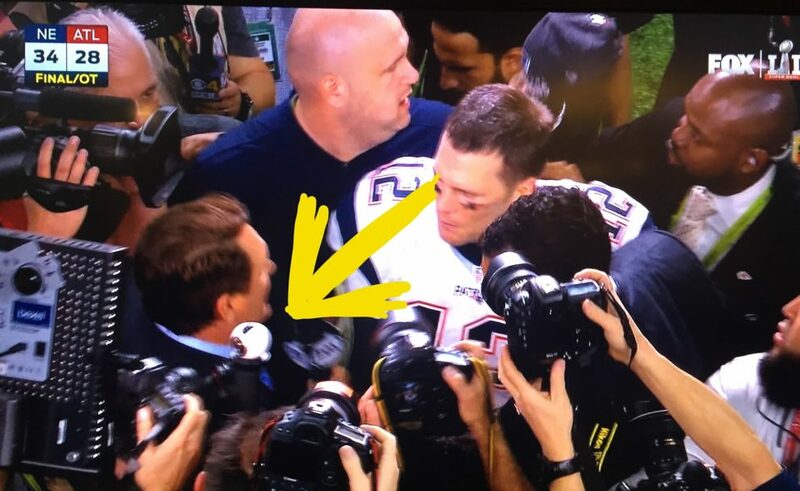 Hopefully they got some useful shots, although that would be very difficult because of the people jostling around Brady, which probably blurred the shot. Plus, the Samsung Gear 360 was surrounded by people at very close range, obstructing its view and making stitching very difficult. The Panono might fare better. I saw it lifted high on a monopod, but it could still be difficult because it was being bumped around. Saw the Gear 360 too. Missed the Panono though. At least the Gear 360 lenses were oriented toward the subject correctly. Im still trying to figure out what the guy had that looked like a Chrome Plate with 2 lens side by side it was Brief showing but had a Stainless steel Finish. I saw the Panono a few times before I saw the Gear 360 but couldn't get a photo in time… :p Hopefully they got a decent video or photo from the Gear 360. Good eye! I saw the same scene but didn't notice the 360 cam. Looked like LED panels to light the player and interiewer.